"War is the most regrettable proving ground. Those who rush to launch it and those who seek to create heroes from it, must remember its legacy. You have to be there to experience the horrors and die to forget them". Vernon Baker said it best in the above quote; War is not what it appears to be. Those who have never been on the front line of battle, in the cockpit of a B-17, or on the other end of the radio in a fox hole, can't presume to comprehend war. War is a life changing experience. Despite the veteran's job or their time at war, serving in the military is an experience that all veterans can relate to. There's a commonality in the military culture that every service member endures. Even veterans like myself who thankfully, never saw the horrors of war firsthand, suffered a traumatizing amount of stress that most civilians cannot relate to or understand. Military service is a unique experience that I wish today's culture appreciated and respected more. I think there has been a culture shift; before this current war in Iraq and Afghanistan, military service was a given. Men were drafted and joining ranks was not a choice. Now, men and women volunteer to fight; leaving the rest of the population without the ability to feel real gratitude for the sacrifice of the volunteers. It's as if war has become commonplace or even forgotten; people are distracted by so many other things in this individualistic society. Veterans were always highly respected in the American Culture. Veterans were the leaders of our country; George Washington was a Commander and our first President. At the very least, children and families would sit at the feet of their Veteran and listen to the stories that plagued their thoughts, heart, and memory. I haven't met a Veteran yet that has "fond" memories of war. But, each one feels a sense of honor, pride and appreciation for their time in service despite their scars and wounds. Like Baker said, only death allows a Veteran to forget. This may seem melancholy or dramatic but in all honesty, it is simply a truth that is rarely spoken of. Every veteran requires special, individualized care. They deserve recognition after what they have been through. Only in the safety of a VA hospital or local VA clinics can Veterans feel safe enough to share what they have seen and internalized while serving in the military. Here they can shed a tear with a nurse, doctor, or social worker. Here they can talk about their nightmares and other PTSD symptoms hopefully, without judgement or fear of being misunderstood. An important characteristic to remember about Veterans is we are a proud bunch. We are proud of our time in the service and the freedom we offer our fellow American's every day. I think it's fair to say people view veterans as being tough. Often when people find out I was in the military, they say "Oh, so your tough. Can you beat me up?" This is an honest question and a humorous one considering my stature and gentle nature. But it also speaks volumes of what America expects of its Veterans; especially female Veterans. I not only had to be tough, but also survive in an environment made up of almost entirely men. Females were outnumbered about 33 to 1 in 2005 in the Air Force. 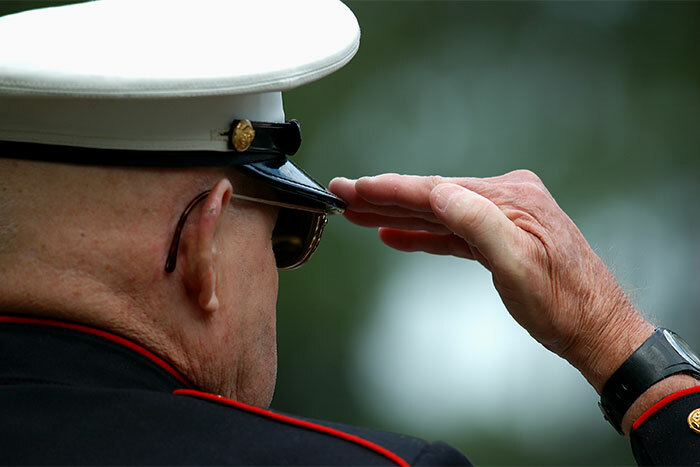 Veterans are expected to continue living a normal life after all that they've seen and done. We are expected to be stronger than other people somehow. What makes me different from you? The only difference is I volunteered to go. For men during the time of the draft, the difference is their name was called. But my heart hurts the same as any other. My "toughness" didn't harden me; it only taught me to have courage and keep fighting no matter what lay ahead. The same as it did for most Veterans. It's very common for Veterans to come to terms with what they've witnessed and did in the service, years later. PTSD symptoms sometimes won't surface until days, months, years, decades after the trauma (2017). It all depends on the person. Some Vietnam Veterans I see are just now realizing they have PTSD or even what it is. It's a very difficult moment of clarity when you realize your whole life has been sculpted by a few years wearing a uniform. I say all of this to explain that the "toughness" we see veterans carry with them, like a rucksack on a 50-mile march, will still be very present in their hospital bed. Every member of an end of life care team needs to prepare for this when treating their patients. The veteran may not want to speak about his/her pain, whether mental or physical. They may act as if everything is ok even when it's not. But although the veteran feels they must be strong, perhaps for himself/herself, or for their family; it doesn't mean he/she wants to. I don't always tell my husband about my pain because I've been taught to be tough. I feel like a failure when I can't "keep it together". I feel like I must be strong for everyone around me. I believe everyone expects that of me. I'm a Veteran, I volunteered to die if necessary. Failure, tears; are not an option. This type of mentality may seem ridiculous to some, but I can assure you it is realistic. If you are caring for a veteran at his/her end of life, remind them it's ok to express their pain. Dying is not failure, it is a normal part of life. Vernon Baker also said, "Home is where the heart can laugh without shyness. Home is where the heart's tears can dry at their own pace." Acceptance of death (defeat) may never come, but an understanding caregiver or family member can make all the difference for a successful end of life. Let the Veteran share their stories if they want to share (even if you've heard them a thousand times). Let them talk about their brave Commander, their fellow soldiers, or the gangrene that resulted from weeks of walking in wet boots in the Vietnam jungle. But respect their silence as well. For some, the memories are just too painful to share. PTSD is more common in the veteran population than I believe the public realizes. An article by Richard Sisk (2018) from military.com states the Department of Veterans Affairs estimates that "PTSD affects about 31 percent of Vietnam veterans, 10 percent of Gulf War (Desert Storm) veterans, 11 percent of veterans of the war in Afghanistan, and 20 percent of Iraqi war veterans". In my opinion, I think the actual numbers are much higher. It is necessary that anyone caring for a veteran, especially at end of life, become very aware of PTSD and how it can affect someone, medically and emotionally. Taking care of a Veteran at the end of his or her life can be a very rewarding but also very trying job. Veterans' who were in combat often relive what they saw (PTSD) and even the memories of those they killed. They may still see the faces of fallen comrades or the rivers of blood on the battle field. Reliving these painful memories is hard enough as a young man, but imagine seeing them repeatedly when you are dying. The psychological toll is enough to drive anyone insane. This Veteran's Day, don't just tell a Veteran you are thankful for their service, show them. Make sure they know that their continual sacrifice is not in vain. That is why I am here. Show them they have a reason to be proud: because the American public knows that war is not just legacy and heroes. War is a necessary evil to preserve life which we each hold so dear… until even our last moments here on earth. You can't possibly understand that which you haven't endured yourself, the best you can offer is empathy. Empathy, like a diamond, is rare.